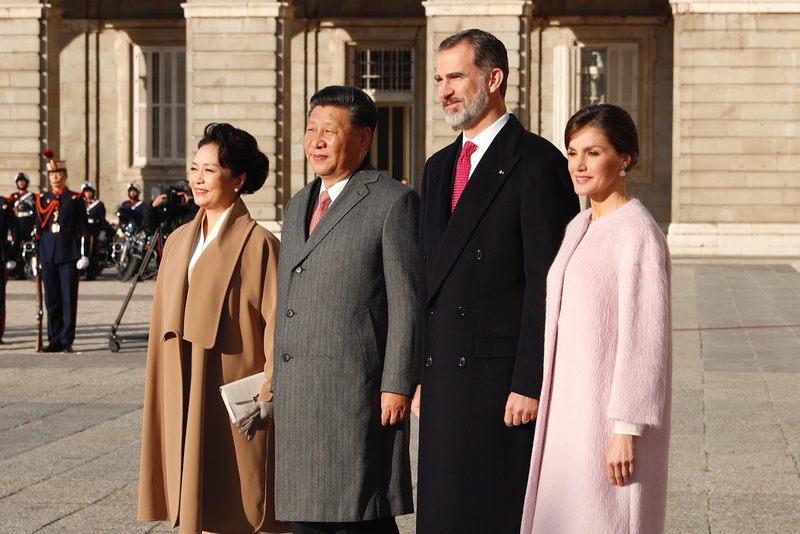 After last night private dinner, today King Felipe and Queen Letizia gave an official reception to Chinese President Xi Jinping and First Lady Peng Liyuan at Royal Palace of Zarzuela in Madrid. The Chinese Couple arrived at the Palace in the early morning. 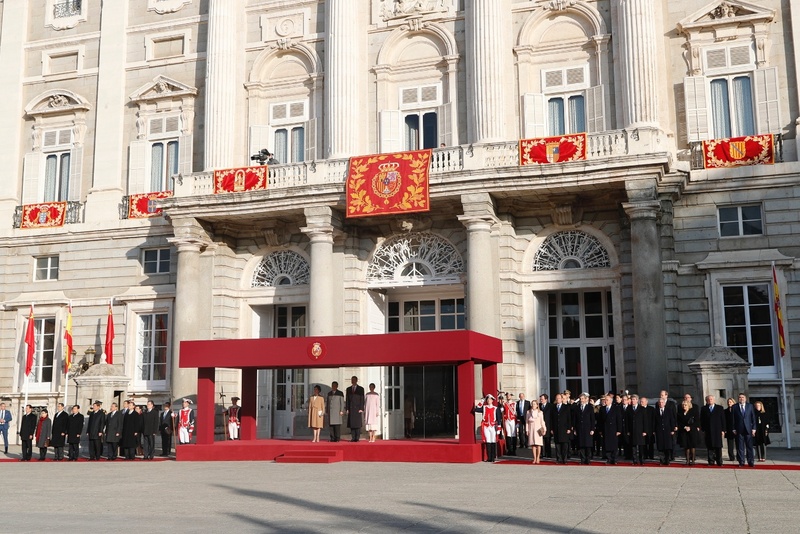 President JingPing and King Felipe reviewed the troops at the official welcome ceremony. During the welcome ceremony the couple received the Royal Guard of Honour parade. 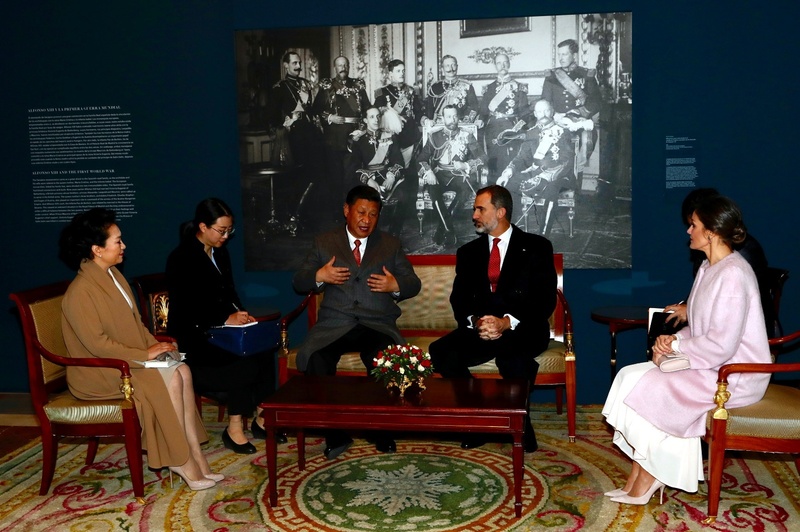 Both couple held a brief meeting at the palace. 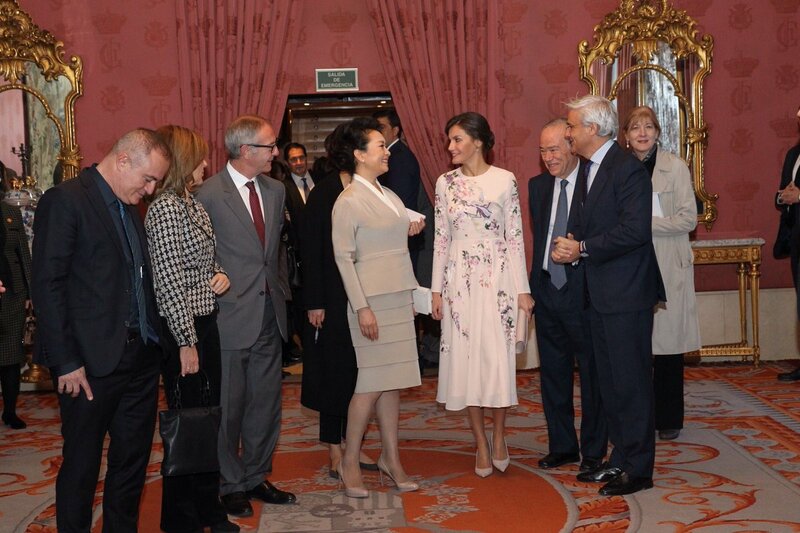 Then Queen Letizia accompanied First Lady on a visit to Royal Theater of Madrid. Upon arrival the ladies were welcomed by Minister of Culture and Sports and Director-General of the theater. 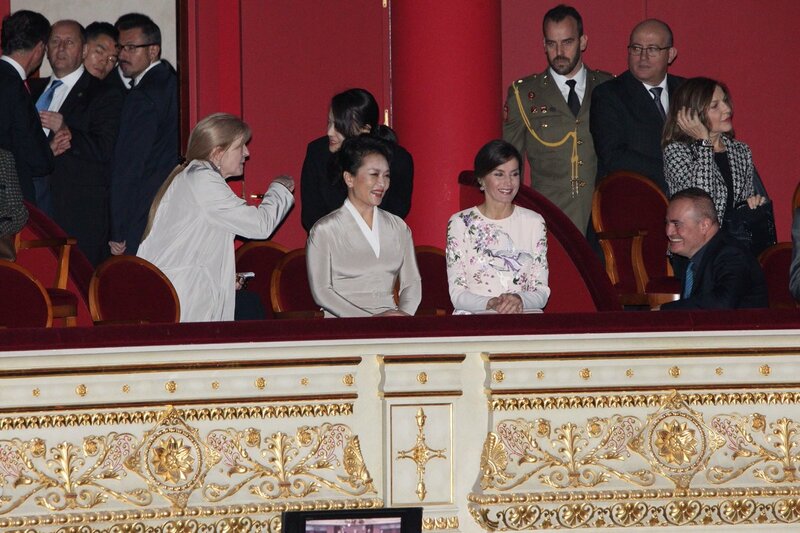 Queen sit with First Lady in the Royal Box of the theater to see the lightening rehearsal of the Turandot Opera. 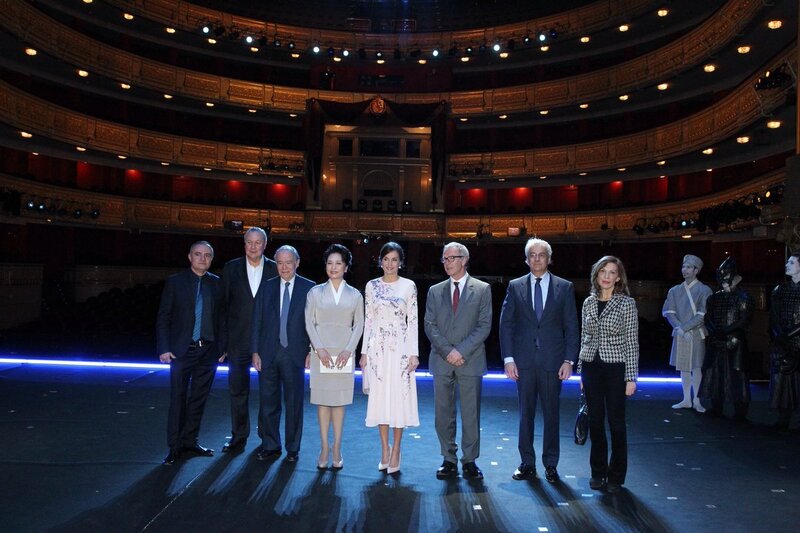 Next Letizia and Mrs. Peng Liyuan toured the theater and received briefing about the history of the theater from the artistic director of the Teatro Real. Letizia and Mrs. Liyuan during the tour of the theater. 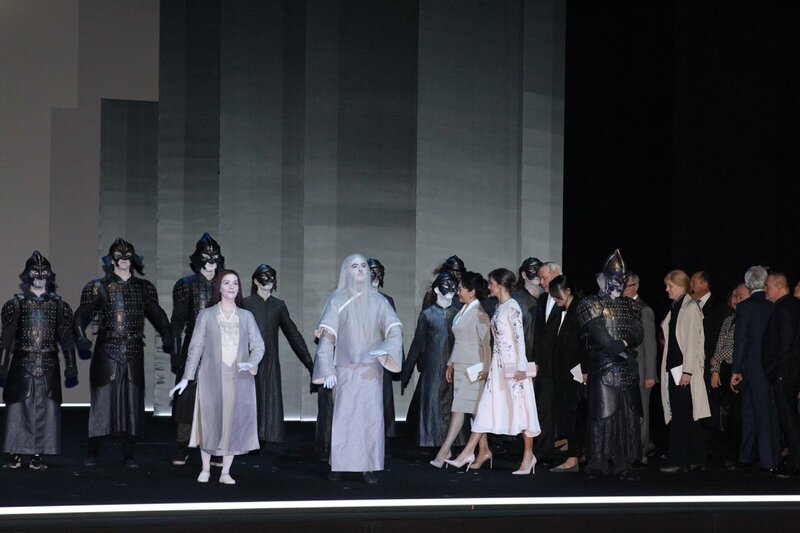 Before leaving Letizia and Mrs. Peng met with the artists performing different operas at the theater. 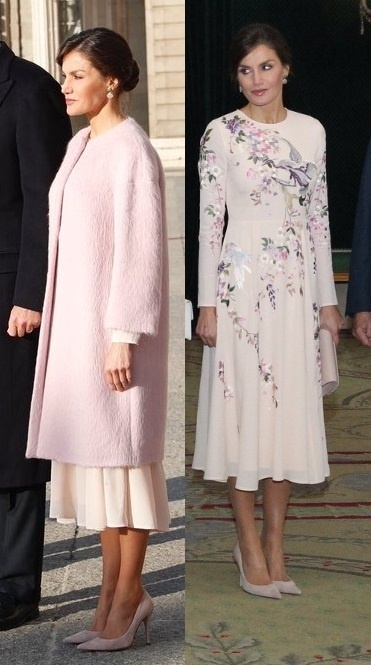 For the day, Queen Letizia chose a very beautiful elegant and I must say economic look. She was wearing a pink Carolina Herrera Coat. The pink brushed wool coat is from designer’s Autumn-Winter 2017 collection. 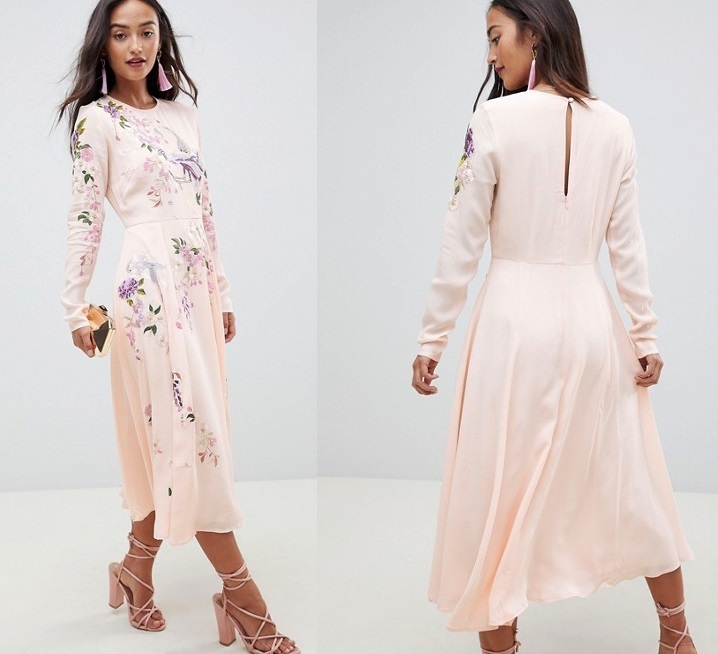 Underneath the coat ASOS design midi dress with pretty floral and bird embroidery in pink, green and purple on it. Thanks to Núria Tiburcio for the quick id. The fully lined $119 fully lined dress featured crew neckline, button-keyhole at the back, full sleeves and full skirt. The midi dress was a really surprising choice on Queen’s behalf giving the occasion of a state visit. But I really like the dress and the way she carried it – very elegant. She paired the dress with blush pink bespoke suede pumps from Magrit. She was carrying a matching blush pink Magrit clutch. A closer look at the bespoke clutch. 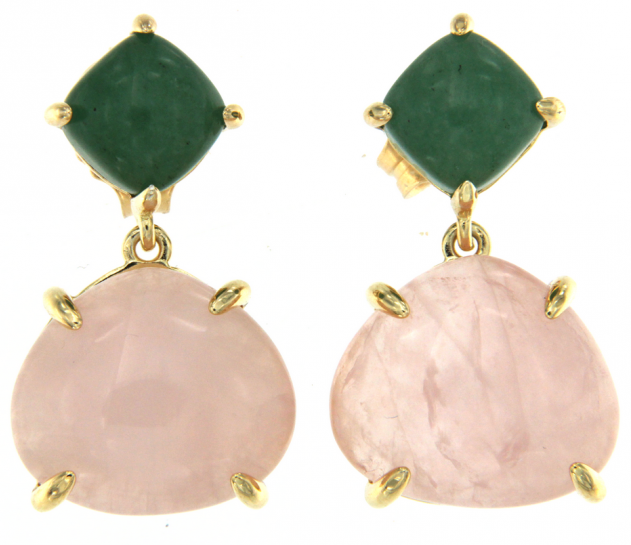 Her CooLook Sarin earrings that she has in her jewellery box for a long time finished today’s look. Tonight Felipe and Letizia will host a gala dinner in the honour of Chinese state visit at Palace. Stay tuned! !